Things haven’t gone to plan so far in the return of Personal Diary to the site of her upset victory, at odds of 9-1, in last year’s Grade I Del Mar Oaks. The Kentucky-bred 4-year-old daughter of City Zip was sent west from Kentucky in early July by trainer Victoria Oliver with the idea of running in the Osunitas Stakes on July 18, the first Saturday of the meeting. Which turned out to be the first of two straight days of rain at Del Mar. The Osunitas was taken off the turf and Personal Diary was one of nine runners from an original 14 entered that was scratched rather than run on a muddy main track. Saturday, three weeks later than intentioned, Personal Diary will be part of a nine-horse field for the Grade II $250,000 John C. Mabee Stakes. It’s over the same course and distance, 1 1/8 miles as the one where Personal Diary made Oliver the first female to train a Del Mar Oaks winner. Oliver was en route to Del Mar from the Midwest on Thursday morning but assistant Brian Duggan said there’s reason for optimism for the filly who hasn’t hit the board in her last four starts, three of them this year. The field for the John C. Mabee , which goes as the eighth on a 10-race card, from the rail out: Notte d’Oro (Flavien Prat, 15-1), Emotional Kitten (Gary Stevens, 4-1), Fanticola (Joe Talamo, 5-2), Stormy Lucy (Rafael Bejarano, 4-1), Personal Diary (Brice Blanc, 15-1), Gusto Dolce (Martin Pedroza, 20-1), Queen of The Sand (Drayden Van Dyke, 7-2), Elektrum (Victor Espinoza, 6-1) and Blingismything (Tyler Baze, 12-1). J. Paul Reddam has eight wins as an owner thus far this season – seven in his Reddam Racing colors and one as part of a partnership. The record for wins by an owner in a season at Del Mar is 18 by Marion R. Frankel in 1973. Mrs. Frankel’s horses were conditioned by future Hall of Famer Bobby Frankel (no relation), who was Del Mar’s leading trainer that meeting with 21 wins. The $26,731 payoff for a 10-cent Superfecta ticket in Wednesday’s fifth race was a track record, eclipsing the $25,536 of the second race on August 8, 2010. Wednesday’s payoff was the result of a win by 21-1 Fashion Gem followed in order by Silver Score (40-1), favored Lily Pod (2-1) and Rockport Dancer (28-1). The Triple Crown champion walked in the stable area for the fourth day in succession since his victory in Sunday’s $1.75 million Haskell Invitational. He is expected to return to the track Friday morning (7:45-8 a.m.) for a routine jog. Trainers Paddy Gallagher and Jim Cassidy will provide expert opinions on the Saturday and Sunday cards respectively as featured guests on the weekend handicapping seminars. Gallagher has 11 stakes wins at Del Mar from 1998 forward. Later on Saturday he’ll be saddling Queen of the Sand in search of his second John C. Mabee Stakes. The first came with Magical Fantasy in 2009. 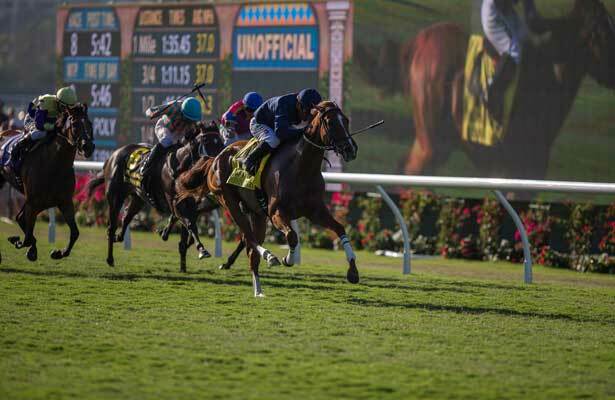 Queen of the Sand became the first stakes winner of Bing Crosby fall meeting at Del Mar when she took the Kathryn Crosby on opening day of the inaugural meeting, November 7, 2014. Cassidy, who will be host Millie Ball’s guest on Sunday, has 11 Del Mar stakes victories with four of them coming in combination from meeting divisional champions Evening Jewel in 2010 and Tom’s Tribute in 2014. The seminars will be held from 12:45-1:30 p.m. both days at the Seaside Terrace near the top of the stretch. CLOSERS – Ship And Win eligible horses on Thursday’s program are: Avicii (1st, Phil D’Amato, trainer), Chasing The Heat (4th, Henry Dominguez), Second Proposal (4th, Eric Kruljac), Alltheleavesrbrown (5th, Mike Stidham) and She’s Not Here (7th, Victoria Oliver) … Selected workouts from 134 on the dirt and 20 on turf officially timed Thursday: Dirt – Hoppertunity (5f, 1:00), Daddy D T (5f, 1:00.40), Baruta (4f, :49.40); Turf – Bal a Bali (7f, 1:30.00), Winning Prize (6f, 1:16.00), Talco (6f, 1:14.60), and Om (3f, :35.00).